Northwestern University’s Co-Director of Intelligent Information Laboratory, Kris Hammond, explains the concept of crowdsourcing and how Amazon, crowdSPRING and Threadless employ various aspects of crowdsourcing in their respective business models. He is being interviewed by Phil Ponce on local PBS station WTTW 11, and this spot aired on Wednesday, April 15, 2009. A really simple and clear video, great to look at having in mind the current developments of crowdsourcing. This spot, broadcasted on CBS News’s “Up to the Minute” in May 2010, features Brian Bednarek, CEO of Mesh 01 and Industry Analyst. He presents the concept of crowdsourcing pretty well, explains how it’s changing the way companies work and discusses with anchor Michelle Gielan how it can be useful in a recession-struck economy. He cites platforms like TopCoder and his own company, Mesh01. This spot is in French, as its drawn from the French pay-TV channel Canal+, which was one of the first to cover crowdsourcing in France. The two French platforms Hypios and eYeka were featured in La Nouvelle Edition, a daily talkshow about news, trends and culture. In a first part Canal+ showed eYeka and one of its clients, Danone Waters, which launched a contest to get fresh ideas to inspire the redesign of a Volvic water bottle. The second part features Hypios, a Paris-based platform for scientific competitions, and one of their solvers. The above video is an excerpt from the coverage “POLITICS: London Mayoral Election 2012: report on young voters” (see the presentation here) which was broadcasted in April 2012, just before the London Mayoral Election 2012. In this excerpt, you can see Stephen Wise from eYeka present some ideas from eYeka’s community, which came up with ideas to reinvent voting for the Facebook generation. Some of the ideas were featured in a Forbes article in November 2012. Sorry for not being able to share the whole report from London Tonight. This spot is in French. Actually it comes from Switzerland, and it features a participant/winner on the Swiss crowdsourcing platform Atizo, which works with Migros (and many others) around for ideation projects. Most of the spot discusses the fact that crowdsourcing is idea exploitation and that Migros gets a lot more money from the sale of the crowdsourced cereal bar they show at the beginning. They do a false parallel between crowdsourcing and the creation of Nike’s Swoosh and Twitter’s bird logo, saying that the latter where both cheap – like crowdsourcing. This spot is in French, and shows Julien Mechin, co-founder of the crowdsourcing platform Creads (which I covered in 2010 and more recently in 2013), talking about his company. It had just been awarded a prize by Figaro.fr having created a cost-effective alternative to traditionnal agencies, which inevitably channels the discussion towards the ethics of the concept. Still interesting though. I’m not sure whether this one has been broadcasted online or offline, but it’s still being hosted by the BBC on its show BBC News Business, so I’ll fetaure it here 😉 It’s quite interesting as the CEO of Clozette (“a social network that brings people together so they can share their latest fashion questions and ideas“) talks about crowdsourcing in Asia along with the cultural challenges that it implies. It’s also funny to hear them employ the term of “crowdsourcing policemen” about the topic of moderation. This is a really great piece on MSNBC’s Your Business, which explains how Tongal offered a free video contest to Kiva early on in their business history, only to get a great case to show future prospects: “Have you ever thought about giving your service away for free or at a deep discount? That’s exactly what the owners of Tongal did, and their strategy worked.” Interviews from Tongal managers, creatives and clients are also included, making it a cool video to understand one of the ways to crowdsource video advertising. Here, Ray Suarez from PBS News Hour interviews former deputy homeland security adviser Richard Falkenrath and Will Oremus of Slate about the role of Reddit in idenitying (or not) the Boston Bombers. “Sophisticated technology and crowdsourcing have helped police and the public work together in identifying the suspects in the Boston bombing. But some of the theories posited online have targeted innocent people,” the description says. There’s some interesting discussions also on Daren Brabham’s blog about it. This is in French again, and it’s a spot that shows a radio recording. On one of France’s main radio stations, Europe 1, Sandra Freeman presents crowdsourcing in less than 2 minutes. She cites examples from the beauty and food sectors, and covers a variety of applications, from idea generation (Yves Rocher or Hugo Boss) to information gathering (ShopRise or Open Food Facts). Quite well explained, except the wrong examples of YouTube and Wikipedia at the beginning. This video, embedded from YouTube (just watch until 02:40, the second part repeats the first), was broadcasted in France in May 2013. It features Olivier Boulanger (boulanol), amateur videomaker who often participates in video contests, as well as eYeka‘s CEO François Pétavy. Inevitably, the coverage askss with the question whether crowdsourcing kills traditional agencies, without giving any convincing argument though. This piece of “news” really looks like paid PR as the opening minutes show the Sydney-based Freelancer.com explainer video, but the subsequent interview is actually quite interesting. The guest, Adric Schreuders, Regional Director of Engineering, talks about the website and the fact that Freelancer.com opened engineering offices in the Philippines (ANC is the Philippines’ only 24/7 cable news network). The anchor has some funny questions like “What is the weirdest project you’ve seen?” The interview ends with another PR message: the promotion of a software engineering contest in the Philippines, launcged by Freelancer.com. This spot, published by the Philippino network People’s Television (PTV), talks about Senator Teofisto Guingona III’s “Crowdsourcing Bill” project, that planned to allow citizen to participate in law making. He is one of the few people in the world to understand the benefits of crowdsourcing as a tool for direct democracy. This piece is in Spanish, and features one of the winning spots of Coca-Cola‘s “First Times” contest on eYeka, even if it doesn’t explicitly cites the latter. Watch the winner announcement here, and the winning spot here. The creator of the spot, Marcs Pitarch from Slyman Arts, explains how they got the idea of the spot, how they produced it and reflects of the enormous success of the video. That’s what I understood with the little Spanish I understand. Did I miss something? In Australia, the New South Wales government announced that it would use crowdsourcing to seek solutions, first to traffic problems and then more broadly to government policy challenges. 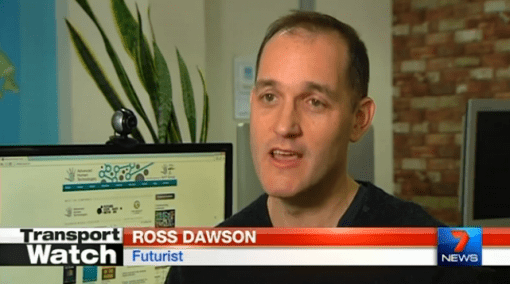 As futurist Ross Dawson explains on his blog, the Australian news channel 7 News did a piece on the story, which you can watch by clicking on the image below. Ross Dawson very briefly explains some of the many ways that crowdsourcing is helping to provide traffic solutions, ranging from aggregated data approaches through to individual reporting which allows people to report traffic danger spots. Unfortunately the coverage is very short and gives a voice to the opposition leader who, of course, dismisses the idea! You may have heard about Poptent’s difficulties, the Poptent & Userfarm merger, the following “de-merger”, all the unpaid filmmakers complaining about the money they are owed… and that might never see? Well, FOX 29 Philadelphia – where Poptent was headquartered – has picked up the news, as VCN noted. In their “Filmakers Says Poptent Closed Its Doors” piece, the channel’s Bill Anderson goes to the company’s empty offices and interviews filmmakers to find out that the latter are left in the dark. “We’ll continue to try to get a response. But until then [the filmmakers] just wanted their cautionary tale out there, so people could be aware [and] careful,” Anderson concludes. I hope this is not how all crowdsourcing platforms will end up, because that is both messy and deeply unfair! On June 4th 2015, the French investigation show Envoyé Spécial has aired a reportage about Mechanical Turk, the crowdsourced micro-task service on which humans are asked to perform easy task for little pay online (see my post about MTurk research for example). I expected a very critical piece, similar to the “Spécial Investigation” mentioned above, but it was actually quite well made. Turkers from across the globe are portrayed, many of them earning decent money despite the few cents that each individual task is being paid. In developping countries, Turkers make more than the average worker of their countries. If you understand French, watch it. Here’s the MTurk reportage, and here the whole show of that evening.